Bromley Mountain is the perfect family mountain located in easily accessible southern Vermont. Known as the Sun Mountain, it's the only mountain in Vermont with southern exposure. Ski Magazine has rated Bromley #1 in North America in Family Programs. 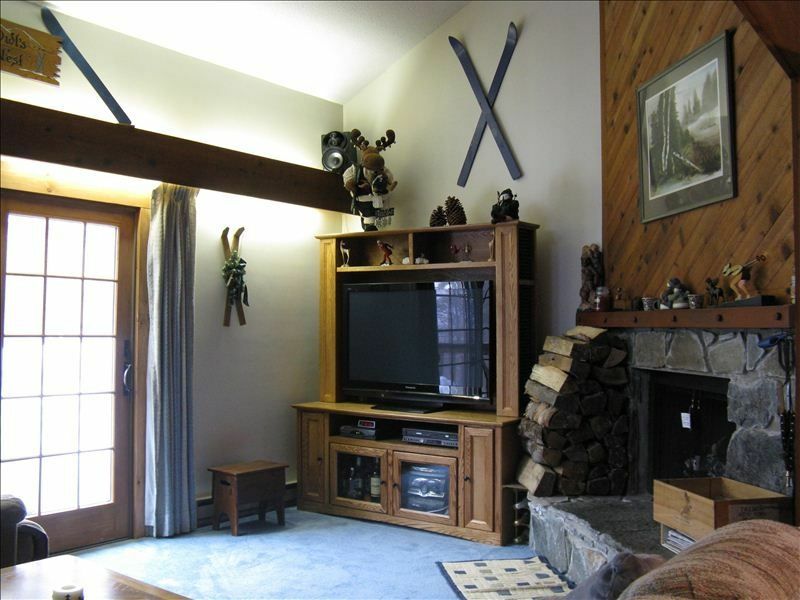 This 3-level mountainside ski in / ski out condo is ideal for year round memorable family and friend vacation adventures. The condo is located in the highly desirable Birches B section of Bromley Village. This prime location provides convenient access to the slopes by a very short walk across the parking area to the Plaza ski trail. Literally ski back to the front steps of the condo via a trail known as the Enchanted Forest accessed directly from the Thruway ski trail. It's hard to compete with this level of convenience. Why hassle with driving, parking, shuttle buses, lockers, and crowded base lodges? The condo is also conveniently located within a 2 minute walk of a heated, outdoor pool with a lifeguard, tennis courts, fitness/ recreation center complete with ping pong, foosball and WiFi. Bromley is home to Vermont's largest fun park - the Sun Mountain Adventure Park which includes alpine slides, zip lines, rock climbing, bumper boats, mini-golf and more. The mountain is only 6 miles from the famous Manchester Village which contains great shopping at numerous outlet stores and a diverse variety of excellent restaurants. Cross country skiing, snowmobiling, horse and sleigh rides, ice skating, hiking, fishing, golf, mountain biking, and antiquing, etc. are all nearby. The condo provides convenient accommodations for those enjoying the annual Vermont Summer Festival & Horse Show. Regardless of the season, this clean and cozy condo is equipped to make your stay fun. Pack light because the condo contains: toys for the kids, games for the adults, a bumper pool / poker table, 3 TV's with Bue-ray / DVD players, Xbox, PlayStation II and an assortment of games, dart board, and a variety of sleds and sporting equipment. Adults and kids will all appreciate the free Wi-Fi..
Family of 4 from Long Island NY that loves the beach in the summer and skiing in the winter. All learned to ski on Bromley Mountain. Bromley Mountain is the perfect family mountain located in easily accessible southern Vermont. Known as the Sun Mountain, it's the only mountain in Vermont with southern exposure. Ski Magazine rated Bromley the #1 in North America for Family Programs. Ski Magazine also stated “If you can find a resort that feels relaxed and welcoming on the busiest day of the season, you have found a friend. Families, meet Bromley. You’re going to get along just fine.” Bromley is also home to Vermont's largest fun park - the Sun Mountain Adventure Park. The mountain is only 6 miles from the famous Manchester Village which contains great shopping at numerous outlet stores and a diverse variety of excellent restaurants. The ski in / ski out functionality of this condo provides tremendous flexibility and convenience. You'll be spoiled quickly with the eliminating the need for shuttle buses, lockers, and crowded base lodge lines. This convenience is especially beneficial for families skiing with young children who tend to get tired and cold quick. Returning to the condo for a break, meal or to get warm is easy. The condo is also equipped to make your stay fun. Pack light because the condo contains toys for the kids, games for the adults, a bumper pool / poker table, 3 TVs with DVD players, PlayStation II and an assortment of games, dart board, and a variety of sleds. Variety of Sleds, Baby & Children Toys, Board Games, Dart Board, Sporting Equipment, Bumper Pool Table with Poker Table Top, Stroller, High Chair and Humidifiers.